BulzEyePro® will send you to the Winner's Circle! Before you Buy - CLICK HERE! The original BulzEyePro® Optical Boosters with the Factory-Look metal housings purchased from this website are packaged as shown. 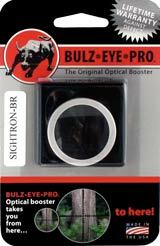 If you order a BulzEyePro® All-Competition Factory-Look Booster and it does not arrive with this packaging, please contact us. Competition shooters will experience the extreme scope image boost of the brightest, clearest, most sophisticated shooting lenses available to the public. These satellite-quality dual-polymer lenses feature our proprietary coatings and manufacturing techniques, which offer the ultimate anti-mirage and zero parallax properties that are proven accurate beyond 3,000 miles. The Factory-Look lens housing is machined from the highest grade billet aluminum. 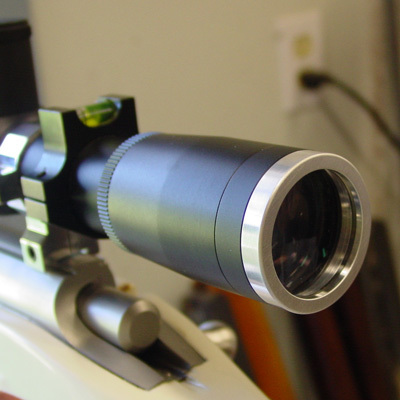 We manufacture five different housings which fit the Leupold Competition Series made after 2003, Weaver T-Series, Sightron BR Series, Nightforce BR series, and the March. Choose from (S) silver finish or (B) black matte finish. in the diagram, give us a call with the measurement and model number. This housing fits Nightforce Bench Rest scopes, but NOT the new Competition Scopes. DISCONTINUED HOUSINGS. Special sale pricing only while supply lasts! IMPORTANT: Does NOT fit newest single-power scopes! Returns must be made to the merchant from which you originally purchased. *Please note: Be sure to include your telephone number. IMPORTANT: Products returned for refund must be shipped within 45 days of purchase, with the original packaging (as shown in photo at left), or a refund will not be provided. BulzEyePro® is not responsible for return items lost during shipment. PayPal purchases will be refunded through PayPal. Defective items returned for replacement do not need original packaging. Please ship to the address indicated above. Profits from BulzEyePro® products are donated to Camp Stand Down Lives, Inc., a U.S. veteran's service organization dedicated to giving veterans a "hand up", not a handout. Learn more about Camp Stand Down or make a donation. We want you to be happy with your Optical Booster purchase. Please DO NOT "guess" which model is best for your eyes. You must take our test before ordering a booster.